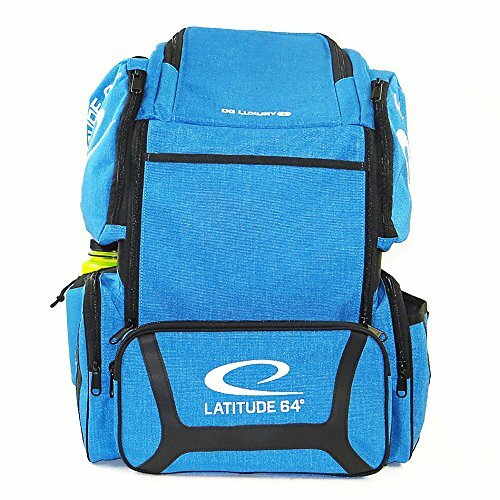 Latitude 64 DG Luxury E3 Backpack Disc Golf Bag::The DG Luxury E3 disc golf backpack from Latitude 64 takes disc golf seriously. This backpack features premium zippers, reinforced side and bottom plate, two side pockets, large top pocket, putter pocket, mini disc slot, umbrella holder and rain cover. Made to carry 20 discs but the bag can accommodate 30 if all compartments are used. With the many extra pockets, you can easily store your extra gear such as towels, water bottles, score card, pens, phone, wallet, rain gear, umbrella, snacks, mini disc and extra clothes. Additionally, unlike other disc backpacks this bag is designed with a unique front pocket so the bag does not tip forward as easy as other backpacks.